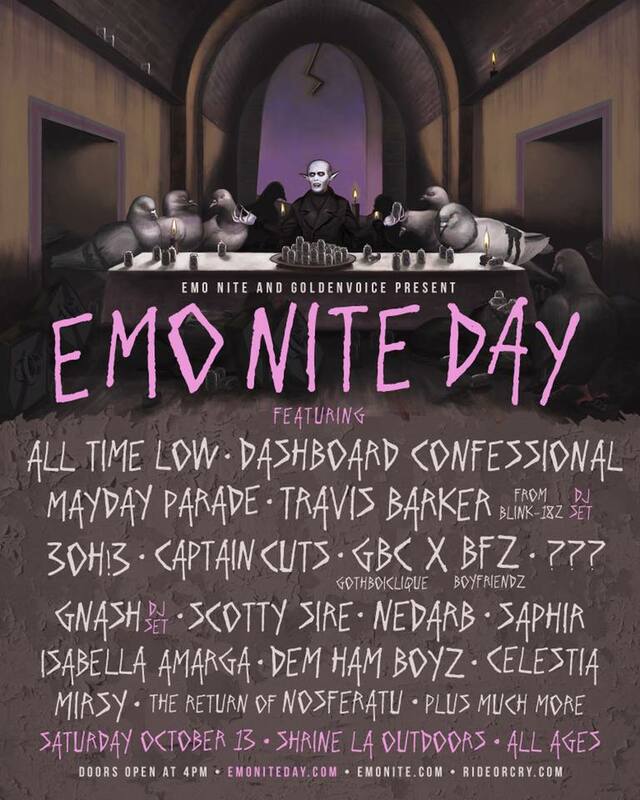 Emo Nite LA recently announced their second annual Emo Nite Day lineup. The full press release can be found below. Emo Nite LA recently announced their 2nd Annual Emo Nite Day Lineup and pulled out all the stops. Festival-goers were treated with the recent announce that the one and only Travis Barker (Blink-182) would finally be joining the Emo Nite family for a special DJ Set. Other full band performances from artists like All Time Low, Dashboard Confessional, Mayday Parade, 3OH!3 (Performing WANT in its entirety), Boyfriendz x Gothboiclique, Scotty Sire and Saphir are set to keep the nite alive along with DJ Sets from Captain Cuts, GNASH, Ham on Everything and more. The second annual full-day festival will take place on October 13th at Shrine Expo Hall + Grounds and tickets are on sale now at emoniteday.com. 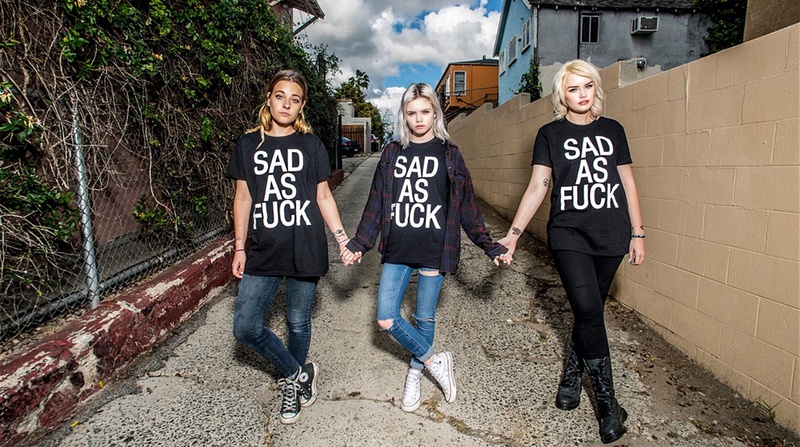 Emo Nite LA, the event started by three friends (Babs Szabo, T.J. Petracca and Morgan Freed) at a small dive bar has grown into a full-blown phenomenon. They have been able to bring together some of the most incredible names in music who have become part of this Emo Nite “family”, including Halsey, Sonny Moore (Skrillex) and From First to Last, The Used, Post Malone, Good Charlotte, All American Rejects, Demi Lovato, New Found Glory, and so many more. They have been able to throw regular events in dozens of markets across the country and have had spots on lineups at festivals like Life is Beautiful, Slam Dunk, BUKU and Vans Warped Tour. In addition to these events, the Emo Nite founders have created successful clothing collabs with companies like OBEY, Urban Outfitters, PLEASURES, Rose in Good Faith, Chinatown Market, OWSLA and more. But above all else, Emo Nite LA brings together people who share the love of emo rock music from the 90’s, 2000’s, and today, changing the idea of what a music event can be. “We’re so lucky to have such a strong and of supportive community of people that have grown with us over the last few years and continue to trust us to deliver meaningful and unique experiences with our events” shared the trio of founders. Recently, it was announced that 3OH!3 and Emo Nite LA would be joining together to present a tour like no other – The WANT House Party Tour!!! Featuring special guest lil aaron, these shows are going to be an actual house party. Fans are going to be able to be a part of each night without the typical constraints of set times and with an opportunity to really interact and connect with artists, just as if you were throwing this party in your own living room. Nathaniel Motte and Sean Foreman of 3OH!3 shared that “We want to include people from different backgrounds, walks of life and foster an environment that breaks down the barrier between the artist and fans. We want to be able to throw a party, celebrating 10 years of WANT and bring the unique energy of Emo Nite along with the energy we have always had.” Tickets are on sale now with a full list of tour dates below. Jackie Cular talks with Frank Zummo and William Beckett at Emo Nite Baltimore.